Condition is Pre-owned. 2.8 grams white gold. Overall weight 3.45 grams. Inside band marked 10 k and RT. Last 2 pics is from a printer just shows detail. This beautiful 4 ct Art Deco Style Swiss Blue Topaz with. 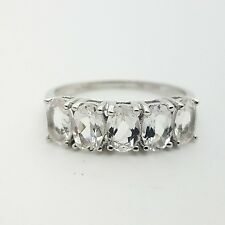 06 cts of diamond ring is in excellent condition. The ring is size 6.5 set in 10k white gold and weighs 4.1 grams. Stamping or Factory Markings: 10K, EMA. The ring weighs ~2.1 grams and is stamped 10k on the inside of the ring. It is being sold at stamped value. I do not think it has been heat treated. The faceted round stone is set in a 6 prong head and is ~10mm. Hallmarked: 14K China PJC. Topaz Height: 6' mm. Topaz Width: 4' mm. 14K White Gold Ring. Band Width: 1.3' mm. 14 kt white gold ring featuring a bezel set oval blue topaz with diamond accents. A twisted design with sparkling round White Topaz CENTER and exquisite setting side stones, elegant display of glittering white Topaz on your finger! • 14kt White gold. With Pave Diamond Band. Round Cut Blue Topaz. Shape and Cutting Style. Round Brilliant cut Diamonds. Pop up Gift Box. Free ring sizing from size 5 to size 8. Center Stone Side Diamonds. Estate 14k Solid White Heart Filagree Cocktail Ring with White Topaz stone. TCW: .11 ct Weight of Piece in grams: 2.08 grams Weight: .81 grams Stone Shape: Round Size: 3 mm Metal Purity: 14k White Gold Measurements: 10 mm top 3 mm bottom Style: Solitare This ring is new and has never been worn. This solid white gold filigree ring has a beautiful delicate feel. The heart is cut out around the prong setting for the stone. The gold weight is 2.09 grams and the ring measures 10mm across the top and about 2.25mm across the bottom. The white topaz stone measures 3x3mm. A 14k white gold ring for under $100 is very uncommon. NOS C. 1960's 10K White Gold GOTHIC. 75 Ct Dark Blue Topaz Ring Size 6 7/8. Goldsmith hallmark stamped GOTHIC. Gothic founded 1917 New York. Stamped 10K. Ring could be resized, but we don't resize rings. 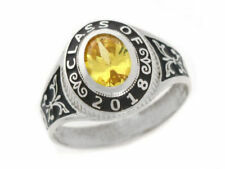 It has nothing to snag or pull on clothing and is a very easy ring to wear as well as lovely looking. Size 7 solid 10kt., weighing 4.4 grams. 14k blue topaz diamond ring. Condition is Pre-owned. Shipped with USPS Retail Ground. 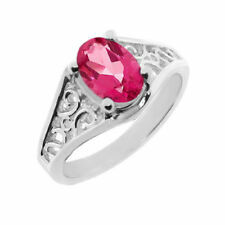 Beautiful 10k White Gold Ring with heart-shaped Pink Topaz. The ring weighs 3gms of 10k Gold and Pink Topaz. The Ring is a size 6.5. This would make a wonder full gift for a loved one or an even better gift for yourself. 10k White Gold Cushion Cut Mystic Topaz. Ring with Diamonds Ring has 3 Diamonds on each side ring size 9 and weight 3.8 grams. Topaz diamond band ring. Promise ring. Size 4.5. Beautiful ring. Still in very good condition. 1.5 TCW PURPLE TOPAZ. BYPASS RING. 10K WHITE GOLD. CLEAR QUARTZ ACCENTS. HEIGHT: 9.8mm. The ring is 3.9 grams of 14k White gold. The size of the ring is 6. We can not have re-sized and will have to be done at your leisure/expense. This is a ring in excellent shape and be great addition to any collection. 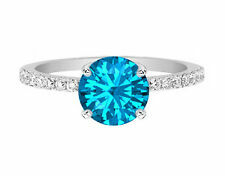 This gorgeous ring is 10 karat white gold with a diamonds that surround a beautiful blue topaz. All gems were tested and verified as authentic. The ring is a size 7. 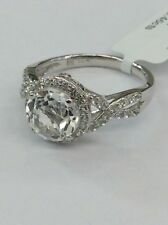 You are viewing a gorgeous 14kt white gold topaz & diamond ring. FEATURING A LOVELY TOPAZ & DIAMOND RING. The majestic blue topaz weighs 1-1/2 ct. t.w. and is surrounded by diamonds weighing 1/10 ct. t.w. color perception may vary due to; eye sight and vision, monitor or phone screen settings. specify the EXACT size needed in your order and allow. This is a free form style ring, has a total of 6 diamonds ( 3 on each side of the gemstone) . Please see ALL photos as they are an important part of the description. This ring is as I found it from an estate, is in overall good used condition with nominal wear.Diamond & Topaz Ring ( topaz is in nominal condition) 750 White Gold. I could not get a clear pic of the marking , it IS marked 750 , tested as , and is non magnetic. Condition is Pre-owned. Shipped with USPS First Class Package, and buyer pays actual shipping cost. I do not offer returns after 7 days and only if miss represented. Thank you! Please have at lease 15 positive feedbacks before bidding. Thank you! Size 6.25, Solid 10kt. white gold, weighing 4 grams. We also buy Gold Jewelry, Diamonds and Watches. This is a pretty blue topaz bypass style white gold ring accented with three 1mm diamonds on each side. Do not know clarity or color of diamonds. Stamped 14Kt gold. 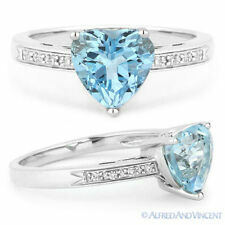 LOVELY 1.97 CARAT TW (05 PCS) GENUINE DIAMOND & BABY SWISS BLUE TOPAZ 10KT SOLID WHITE GOLD RING SIZE 7. BABY SWISS BLUE TOPAZ. Total Weight by Gram: 2.08. Carat: 1.960. Carat: 0.010. Product Categories: Diamond Exclusive. STUNNING 10KT WHITE GOLD .05CT DIAMOND 2.8CT MYSTIC TOPAZ SIZE 7.25. Condition is New with tags. Shipped with USPS First Class Package. THIS RING WEIGHS 1.8 GRAMS. 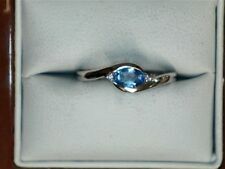 blue topaz ring; 14kt White gold 1.85 cts; ring size 6; certificate included. Shipped with USPS First Class Package. The ring is constructed of 10K White Gold marked 10K. In good used condition. Could use more of a cleaning. The ring would make a beautiful addition to anyone's jewelry collection! If you’re not happy - we’re not happy. 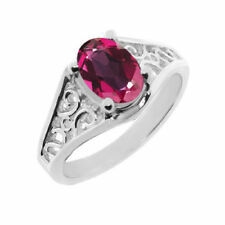 ​Elegant and authentic Marco Bicego ring, well crafted from solid 18k white gold with a high polished finish. The front of the band has a fancy bubble like design set with three oval shape cabochon blue topaz gemstone. Main Stone: Topaz. Accent Stone: Diamond. Set in 10K White Gold. Your satsifaction is important to us. Approximate Size: 6 mm. Approximate Size: less than 1 mm. Purity: 10 K. Inventory: WinEx. Marked 10k. We test all gemstones with a Presidium Gem Tester. Many gemstones' properties overlap and could potentially be one of many variety of gemstones. Band Is 2.0 mm Thick. Ring Is A Size 6 1/2. 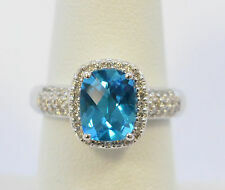 Blue Topaz and diamond white gold ring, size 7. Shipped with USPS First Class Package. Very nice large topaz ring size 8 14k white gold marked and tested ..the smaller stones are cz ..
10K WHITE GOLD. BLUE TOPAZ RING WITH DIAMOND ACCENTS. 8MM X 6MM GENUINE OVAL SWISS BLUE TOPAZ. 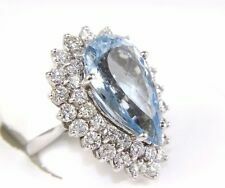 14kt sold White Gold Blue Topaz & Diamond Ring. Shipped with USPS First Class Package. Genuine gemstone and diamonds. The total of diamonds is .30tcw full cut diamonds. Very sparkly. The center stone is unknown carat weight. Please ask any questions before bidding. I use PayPal only for payment. I ship within 3 days. It is set with one oval smokey topaz that weighs 4.51 carats and has a band of 38 round diamonds (I-K color and I1 clarity)around it and down both sides. It is a size 7 but your jeweler can resize it up or down one size for you if necessary.I am not a jeweler or jewelry appraiser. .90ct Blue Topaz. 14k White Gold. Ring Size 2 Diamonds =. 06ct. 10K White Gold. Pink Topaz Ring. Pink Topaz. · Topaz Shape · Topaz Color Light Pink. 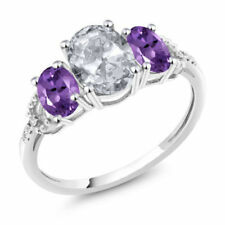 · Ring Size 2.2 mm Princess. Estate Find! A fabulous 10k white gold Samuel Aaron, "THL" designer ring. Classic Elegance! Cushion faceted cut, multi color mystic topaz stone, about 2.5 carat, with three round cut diamonds on each side, size 7, signed "10k THL", total weight 5 grams. Ladies 14 karat white gold genuine princess cut blue topaz 2.16 carat total weight color stone and diamonds. 13 diamond carat total weight ring for birthstone month of December! Size: 7 1/4. This 10k white gold ring features a 7mm x 5mm oval 3/4 ct. t.w. (total weight of stone) light blue topaz. This is a new and never worn Belk & Co. 10k White Gold Sizeable Size 7 Ring featuring a split shank (or split band). It is all 10k white gold. It has a gold scroll victorian design on the band. but many people who want a less expensive but still genuine gemstone choose to use white topaz as an alternative. 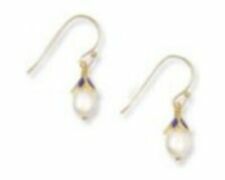 In the center is a genuine oval white topaz 6x4mm (approx. ). 4 blue topaz stones cut to form shape of. 14K white gold. Made in ITALY. Hallmark: 10k. Top Size: 14 x 10 mm. Ring is in very good condition. 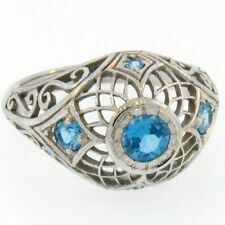 GORGEOUS Blue Topaz , White Gold Filigree Ladies Ring Size 5 FREE SHIP !